I smell pumpkin in the air. This time of the year has me craving pumpkin treats. According to my Pinterest feed, I am not alone in this. Pumpkin treats galore! Also, the extra-long drive-thru line for pumpkin spice lattes is a sure sign that autumn has arrived. The slightly cooler weather has me excited to turn my oven on again, after a summer hiatus, and start baking. 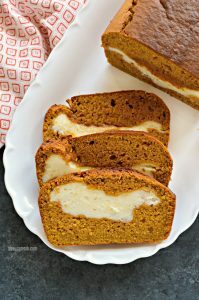 My first pumpkin indulgence of the fall season was a wonderful cream cheese pumpkin bread. It was oh-so yummy and something I’ll be making again soon. I’m sharing my cream cheese pumpkin bread recipe with you today, along with some ways to protect your teeth while indulging this fall season. From baked goods, to candy corn, and Halloween candy there are so many goodies around this time of the year. It is so hard to resist them all. In addition to putting in a little extra time in at the gym, I’ll be focusing on a good oral healthcare routine too. The temptation of some of our favorite fall treats – everything pumpkin spice and apple baked – can take a toll on our smiles. 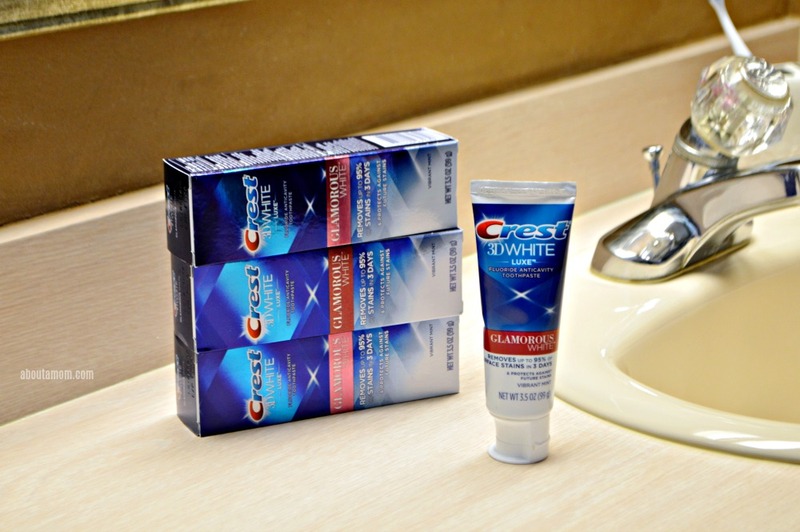 Now is a great time to stock up on Crest 3D White Luxe Glamorous White Toothpaste from Amazon to keep your teeth looking their best. From September 30th through October 1st you can save on the Crest 3D White Luxe Glamorous White Toothpaste 4-pack when you buy from Amazon using Promo Code 24LUXEGLAM. Originally, the 4-pack is $16.99 but after an online $2 discount and an additional $2 promo code, the price drops down significantly to $12.99. This deal is the perfect opportunity, as fall kicks into high gear, to achieve and maintain a perfectly bright smile. Crest 3D White Luxe Glamorous White Toothpaste helps reveal a whiter, brighter smile using a unique foam-action formula that surrounds teeth with teeth whitening agents. This allows for every brushing to give you that all-around clean feeling. Proven to remove up to 95% of surface stains in just 3 days, 3D White Luxe Glamorous White Toothpaste is your ticket to a head-turning white smile. Stock up now and protect your teeth while indulging on fall snacks like cream cheese pumpkin bread. Are you ready for the recipe? 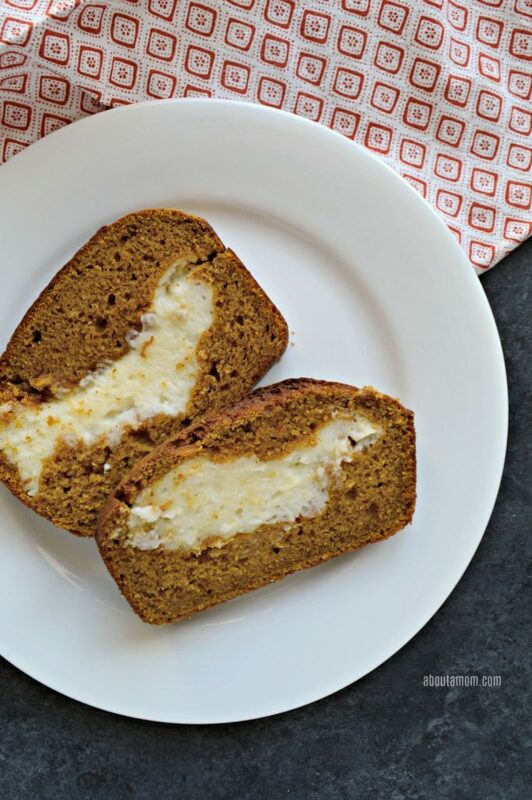 If you like pumpkin pie and cheesecake, you’re totally going to love this cream cheese pumpkin bread. 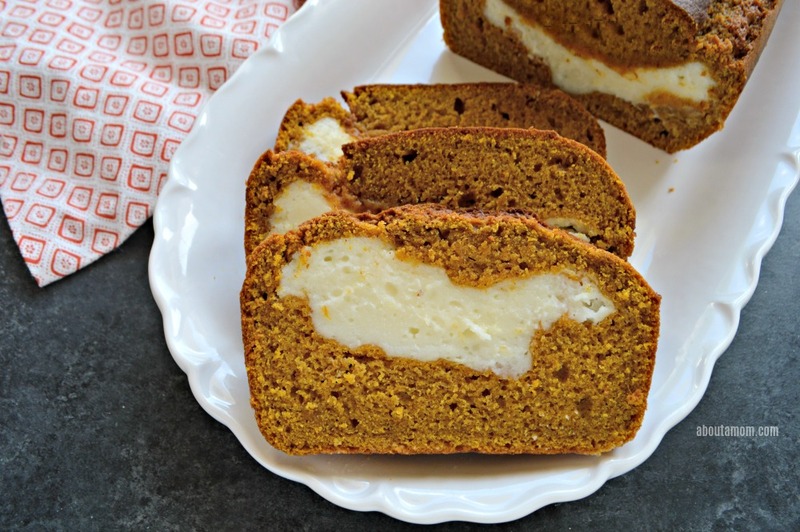 This cream cheese filled pumpkin bread is wonderful because it’s not over-the-top decadent. It’s just sweet enough, and goes perfectly with your morning coffee. Preheat the oven to 350 degrees. Spray the 9×5 bread loaf pan with non-stick baking spray. Set aside. In a large bowl, sift together flour, sugar, pumpkin pie spice, baking soda, baking powder, and salt until combined. Set aside. In another bowl, whisk pumpkin puree, brown sugar, sour cream, vegetable oil, vanilla extract, and egg until smooth. Pour the sifted dry ingredients in with the wet, using a spatula to gently toss and stir, being sure to scrape the sides of the bowl. Mix until just combined and dry ingredients are no longer visible. Do not over-mix. In a bowl, with an electric mixer, mix softened cream cheese and powder sugar until well combined, and smooth. Pour 1/2 of the pumpkin batter into the prepared bread pan, spread evenly across bottom of the pan with a spatula. Next, pour the cream cheese filling into the pan, smoothing out the filing with a spatula. Do not worry about pressing into corners. The cream cheese will spread out once heated. Lastly, pour the remaining pumpkin batter on top of the filling and spread to cover the sides and corners, careful not to disturb the cream cheese layer beneath. Be sure to completely cover the cream cheese layer. Bake bread for 50-65 minutes or until a tester toothpick comes out clean. 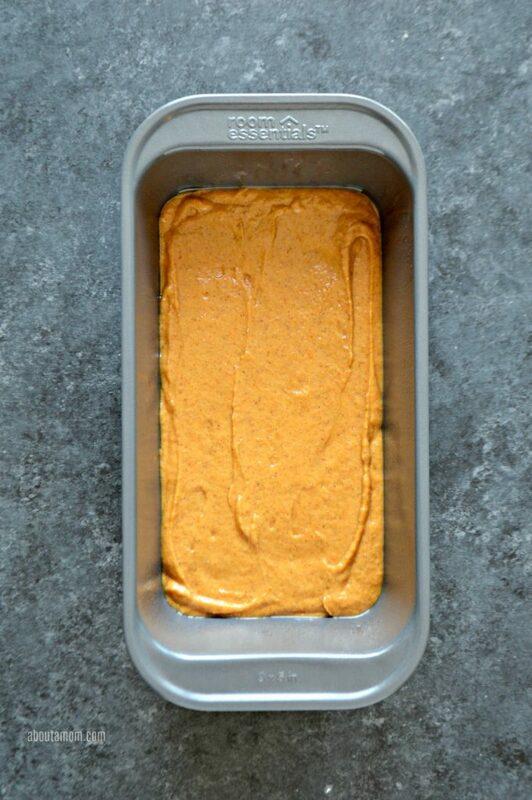 Allow baked cream cheese pumpkin bread cool in the pan for 15 minutes, then transfer to a wire cooling rack to cool completely. Slice pumpkin bread and serve immediately. Store in the refrigerator for up to 1 week in an airtight container. Preheat the oven to 350 degrees. Spray the 9x5 bread loaf pan with non-stick baking spray. Set aside. FOR THE CREAM CHEESE FILLINGIn a bowl, with an electric mixer, mix softened cream cheese and powder sugar until well combined, and smooth. PUTTING IT ALL TOGETHERPour 1/2 of the pumpkin batter into the prepared bread pan, spread evenly across bottom of the pan with a spatula. 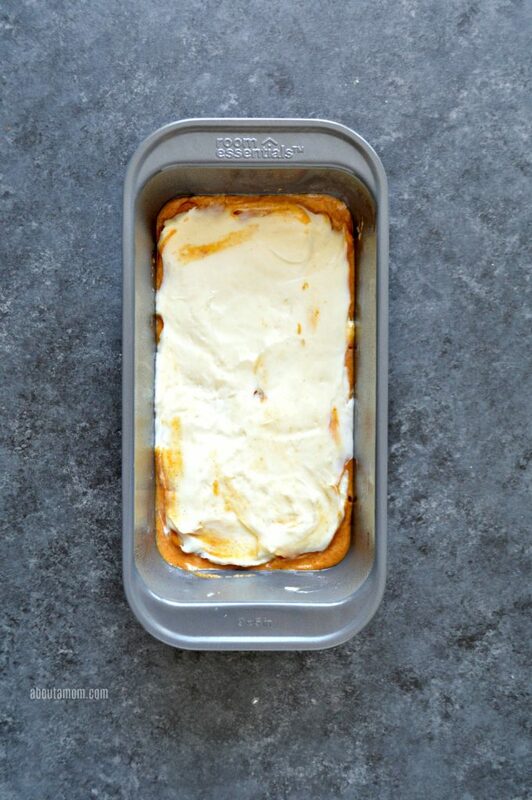 Pumpkin and cream cheese, yummy!I’m ready for all things pumpkin and can’t wait to try this. Thank you for sharing! I need to try this right now! 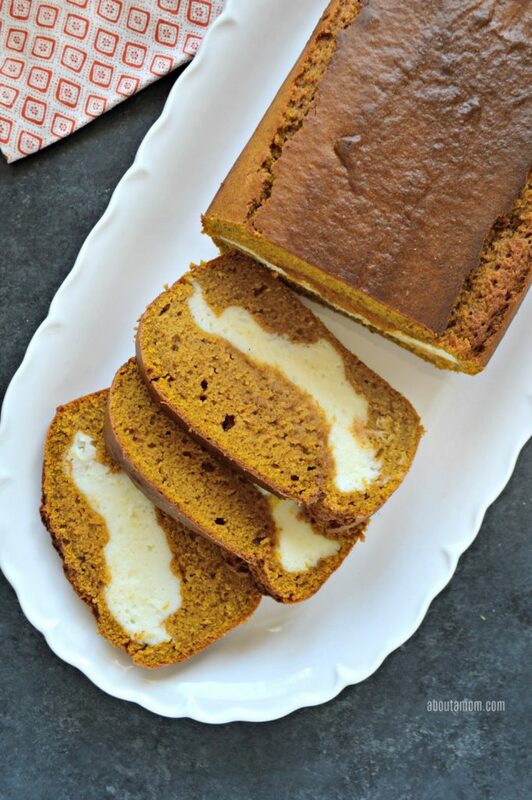 This pumpkin bread looks so yummy! I’d love to make it for my family. Thanks for sharing this detailed recipe! I’d love to make this. Looks so delicious! I am a big pumpkin fan. This bread looks really good! This pumpkin and cream cheese is simply irresistible! I can’t wait to try it. Thank you for sharing this wonderful recipe. I know my kids will love it. This is simply irresistible! Thank you for sharing your recipe. I am sure that my kids will love it. This looks like a great Fall idea. Thanks for the recipe! Looks absolutely delish! I love pumpkin desserts too! It’s definitely so important to follow up with good brushing habits when you are eating sugary foods especially but…any other time as well! Two of my favorite things cream cheese and pumpkin. I plan to make this bread asap! It looks amazing! great combination. I have to try this recipe. Not only does this sound incredible but it’s the perfect time of year for it! This sounds like a delicious recipe! I love pumpkin and cream cheese!! This looks incredible! And I have all the ingredients already. Thank you for sharing. Such a tasty looking recipe. Can’t wait to make this on Halloween. 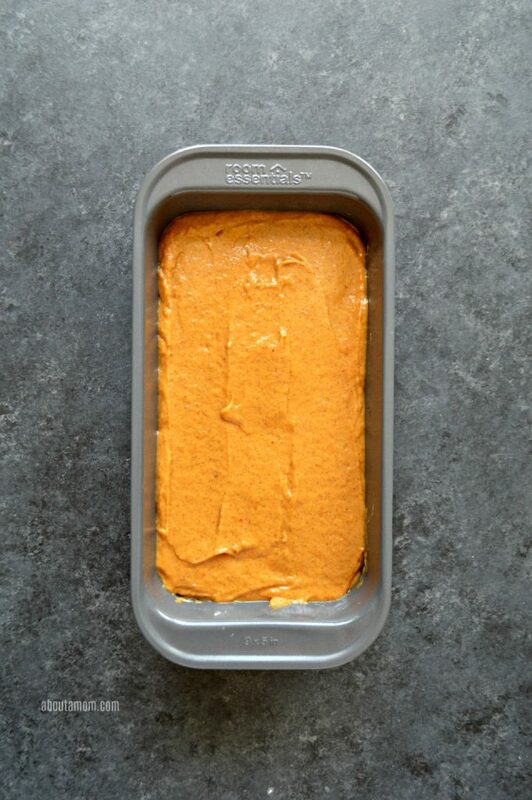 I love pumpkin and am looking forward to making this pumpkin bread for my family! Yum! Two of my favorite flavors combined! This has to be SO yummy! Thank you for sharing this recipe. I love this time of year! It just puts me in the mood to bake and eat yummy treats! I enjoy trying new recipes and have never made any bread with cream cheese in it. So I will definitely be giving this recipe a try. This looks so delicious! Gonna have to make this! Could I just have a spoon and a big bowl of that cream cheese center, lol?? That sounds great.